More and more people today are finding new creative solutions to age-old cooking problems. As a foodie and a busy mom, I couldn’t be happier! Cooking hacks mean more time well-spent in the kitchen! No more wasting your energy trying to peel hard-boiled eggs or slicing cherry tomatoes one at a time. Learn these cooking hacks today and make your next dish with the confidence of a pro. When peeling your ginger, ditch your knife! A spoon gives you a smooth and evenly-peeled ginger, reducing waste. Use the knife only to cut off the uneven nubs. Finish peeling your ginger by scraping the tip of your spoon against the ginger skin. Do you have soft cheese that creates a mess when grated? Let these cooking hacks help you out. Freeze your cheese for a bit before grating it. Simple! Slice all your cherry tomatoes at once. Lay them all out on a plate close together. Press a lid that on top of all the cherry tomatoes and slice horizontally all at once. Genius! Cooking hacks offer a lot of different ways to prevent tears when chopping onions. I prefer this one. For tear-free onion chopping, place your onions in the freezer for 15 minutes before dicing. This will reduce the tear-inducing compounds found in them. If you’ve never experienced having broken egg shells in your batter, then consider yourself lucky. The next time this happens to you, wet your fingers before attempting to pick those shells out. If you’re craving for diner-style hash browns, make them in a waffle iron. It’s a great “hack tool” to have in the kitchen, as it doubles as a sandwich press and can even make perfect cinnamon rolls and roasted chicken! One of the best cooking hacks I’ve ever seen! 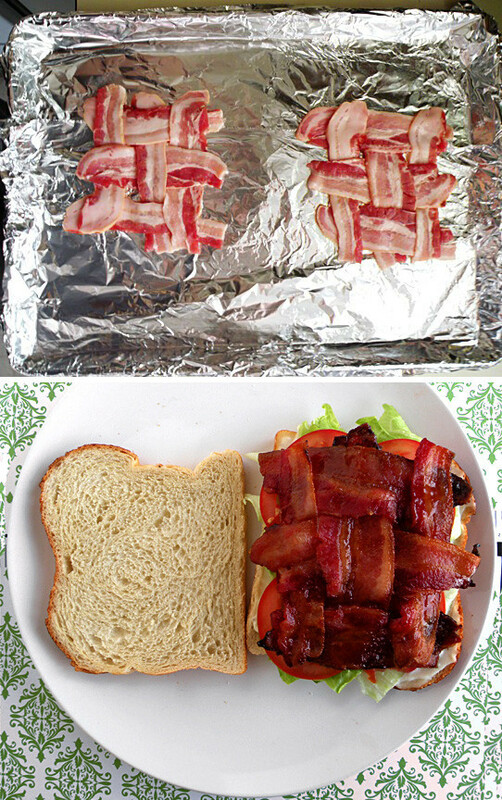 Make the perfect BLT with this crisscross bacon hack! To ensure you get crispy bacon in every single bite, weave your bacon like so (see above). These tacos are a bit wider than traditional hard shell tacos. But you’ll find that these tacos are able to hold more filling and stand upright on their own! Plus, homemade is always better than store-bought. Keep your brown sugar from clumping by putting marshmallows in the bag! These cooking hacks just keep getting better! If you don’t want to put marshmallows in the bag, you can also place apple slices or a wet paper towel to retain your brown sugar’s moisture. 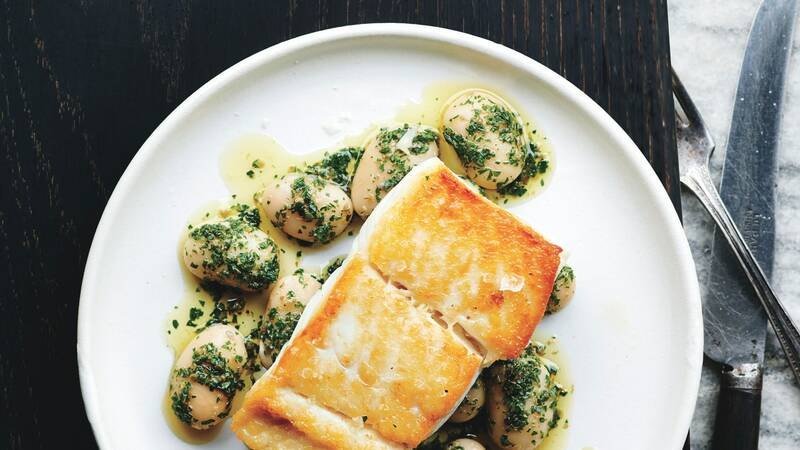 If you’re looking for cooking hacks for fish, take note of this one. Grilling your fish on a bed of lemons will not only infuse a fresh citrus flavor into your dish but will also keep it from sticking to the grill. There are many cooking hacks for eggs, but this one simply takes the cake. For perfect hard boiled eggs, place a tack into your egg before boiling. This will ensure even cooking and will make cracking your eggshells a breeze. Another one of the best cooking hacks for eggs! If you want to see how fresh your eggs are, try the water test. If your egg is still good, it will sink to the bottom of a bowl or cup filled with water. A week-old egg will still sink, but the pointy end will tilt up. A bad egg will float, with the rounded end sticking up. Keep your ice cream soft by placing it in a Ziploc bag and then putting it in the freezer. Who needs soft serve when you’ve got these cooking hacks! Rubber gloves aren’t just for dishwashing anymore. They’re also great for opening stubborn jar lids and other kinds of covers. Looks like the days of banging our jars against the counter are over! Get perfectly shredded chicken every time by tossing cooked chicken breasts into a mixing bowl, and using the paddle attachment of your mixer. Mix on low for 5 minutes for effortless shredded chicken. We have cooking hacks for your health needs, too! For easy vegan whipped cream, refrigerate coconut cream overnight and whip it the next day. To chill your wine, don’t use ice cubes! They’ll only dilute your wine and dull the flavor. Try chilling your wine with frozen grapes instead. Cooking hacks for a fancy dinner? You got it. Nothing goes better with wine than cheese—an entire platter of it! Refer to the image above to construct a perfectly balanced cheese plate. What use are your cooking hacks if you can’t pair your meals with the perfect bottle of wine, right? For those who find wine as confusing as rocket science, here’s an easy guide for you. Cooking hacks cover all kinds of culinary needs—from prepping your ingredients to serving your desserts! Cut mangoes the right way by referring to the video above. Yes, these cooking hacks make it possible for you to make French toast using a Crock-Pot! Simply make the mixture in a separate bowl and pour it over the slices of bread nestled in the Crock-Pot. Let this wonderful kitchen appliance take care of the rest. Artisanal bread is an achievement that takes years of baking experience. For those who don’t plan on becoming master bakers anytime soon, all you need is a Crock-Pot, this recipe, and these cooking hacks. Make the dough according to instructions. Place it in the slow-cooker and cook on high for 45 minutes. Keep your bananas fresh for a longer period of time by separating them and then wrapping each of the crowns with plastic wrap. This will keep them ripe for another 3 days. To keep them crisp and fresh for a longer period of time, wrap your lettuce and veggies in paper towels and put them in a bag. Make sure there are no bad leaves before you do this. Probably the most simple tip among these cooking hacks! Not into eggs? These cooking hacks will take care of that. Use the guide above to find suitable substitutions for eggs in baked goods and dishes. You don’t have to be a vegan to enjoy this wild and tasty soda cake invention. This hack only requires two ingredients and a raging sweet tooth. What did I tell you? No recipe is too difficult or too much with these cooking hacks. Cooking hacks also cover kitchen accidents. If a small fire starts while you’re cooking, use baking soda as an extinguisher. Baking soda releases carbon dioxide, which will stifle the fire. Let these cooking hacks take care of your beverage needs as well. Cool your coffee down without diluting it by throwing in some coffee cubes made from leftovers from your last cup! We recommend trying this hack with specialty coffee. There are those busy nights that require us to make dinner from leftovers. To reheat pizza or other baked goods, place a cup of water in the microwave with them in order to retain moisture and avoid dry, stale food. Soften butter instantly by grating it with a cheese grater or flattening it with a rolling pin. If you’re opting for the rolling pin method, be sure to put your butter in a plastic bag first. Pasta is probably one of the most famous and well-loved dishes. From tomato sauce-based to vegetarian pasta dishes, everyone has a pasta dish he or she loves. But what makes every pasta dish amazing are these pasta cooking tips! No matter what kind of pasta it is, these tips will make you love your noodles even more. With these pasta cooking tips, every kind of pasta you make will be a little bowl of heaven. When speaking of living a healthy lifestyle, people think of specific healthy dishes right away. This means limiting your cooking and food choices to certain meals. This doesn’t always have to be the case. With these healthy cooking tips, you can transform any kind of meal into a nutritious and guilt-free version you’ll be proud of. No matter what you’re craving, there’s a way to make a healthy alternative. Just follow these simple tips. Who doesn’t love a good slow-cooked meal? Nowadays, there’s a slow-cooked version for almost every dish. Slow-cooking is popular because it’s convenient, and it’s such a good method of cooking. It really brings out all the flavors of every dish. In addition to having a little bit of patience, you’ll also need these Crock Pot cooking tips. There’s no better way to fall in love with cooking by knowing exactly what you signed up for and where you’re headed. So, read on for easy cooking tips to make you want to cook! Bacon has been a staple in most breakfast tables for generations. Its savory taste and irresistible aroma help you get your day started on a high note. These bacon cooking tips can transform an average breakfast item into culinary perfection. Decorating cakes and cupcakes can be a daunting task, but that’s where these tips come in! Think of this guide as your kitchen fairy godmother because, with this course, you’ll be performing your own decorating magic in no time! Cooking oils are essential to how your dish will taste. It is vital to know which oils are suited for certain dishes. Lucky for you, this post will guide you which oil to use for baking, frying, or light sauteing. The idea of having to learn how to make the frosting, then piping that frosting artfully on a cake, might be overwhelming. But don’t get intimidated just yet, because there are simple ways you can elevate the look of a cake or any other dessert. You don’t have to be a professional to do it! Certain apps make our lives a lot easier and there are also a bunch of apps that can improve your cooking skills greatly. It saves you a lot of time because now, typing the name of the dish will show you countless recipes and tips for that dish. Here are some of the best apps you should try. The beauty of stir-fried vegetables is, you apply the same method of cooking no matter what kind of vegetables you’re dealing with. Plus, it’s so easy to do, you can make a dish even on your busiest days! Because stir-frying vegetables follows a similar cooking process all throughout, here’s a quick round-up of the things you must remember when stir-frying! Learning how to make the best BBQ ribs can be hard especially for newbies. The good news is it’s not as hard as you think. You don’t have to worry about getting the right tenderness and flavor anymore. Check out this article for more. Ever wondered about how to dry herbs? Then, this must be your lucky day! With this simple and easy-to-do guide, you can have all those once wasted leaves dried and re-used. Here’s a guide for you. One way to build flavor in meat is to sear it. By exposing meat to very high temperature, you get a nice, crisp, golden brown or caramelized exterior without overcooking its center (hence, a beautiful steak). The deep and complex flavor brought out from searing meat can greatly improve the taste of a simple braise, stew, or soup. If you’re a foodie like us, knowing how to sear meat is a must. Check out these simple steps on how to sear meat and start cooking! To help you in your journey towards Knifehood, we’ve put together this amazing Intro to Knife Skills course with basics every home chef should know. There are many different modern versions of french toast that you can try at home. Here is a list of my absolute favorite french toast recipes. Some I’ve tried while others I have not, but they all look amazing and delicious. I hope you enjoy! Always remember, it’s best to prepare, cook, and eat your corn immediately after you have them on hand. So with that in mind, here are three ways most likely to cook our favorite corn on the cob. Food truck brings us nostalgia every time we see one. What’s more, the experience becomes much more special if the food tastes great. Here are some of the best food that is best-suited for this kind of set-up. Did you enjoy these cooking hacks as much as I did? I can’t imagine my life without them! They have made being a foodie, mom, and cook so much better! I always feel like there’s no recipe I can’t master with these cooking hacks. If you have the patience, I’m sure you’ll get the hang of these hacks in no time. Try one today! Do you have any other cooking hacks up your sleeve? Let us know in the comments section! Up Next: 11 Easy Cooking Tips To Make You A Pro! Editor’s Note – This post was originally published in July 2015, and has been updated for quality and relevancy.